John-Paul Young is my brother. Like me, he was born in Te Kuiti, the King Country of New Zealand and the Shearing Capital of the World. He is the former singer-songwriter-guitarist of celebrated Hamilton band the Clampers, and has collaborated and played with and supported a great variety of musicians, including Vorn, the Sproutts, Iron Giant, the New Pornographers, and in another life, Neil Finn. 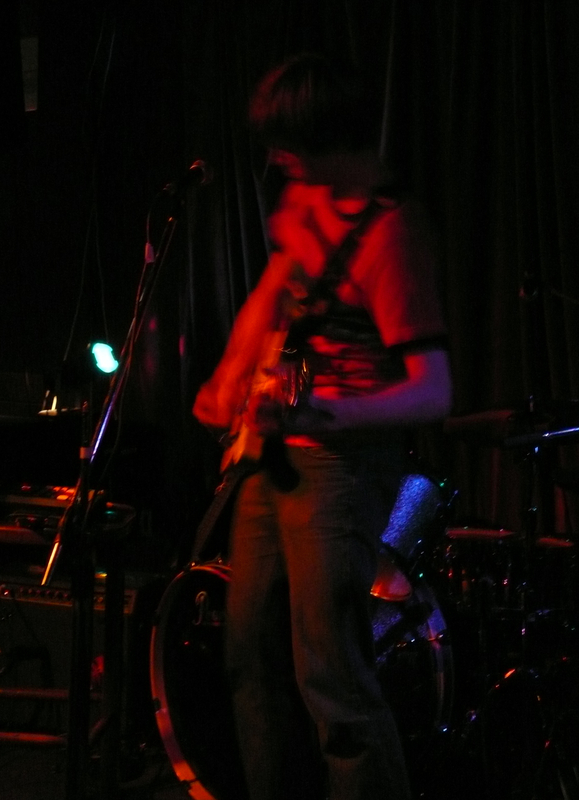 He currently plays solo: his LPs include Jilted (2006) which he describes it as “a fairly miserable, bedroom-bound affair – I spent months thrashing away at it, but by the end I was so dubious about it that I just gave it away for free at the album release gig”; and The Te Kuiti Underground (2009), a “happy mangle” of an album, the title track of which recounts the tale of two questing rock ‘n’ rollers who, inspired by the Beatles, attempt to ignite the musical (and pastoral) landscape of provincial New Zealand in the 1960s. Their music is doomed to obscurity – or … is it? 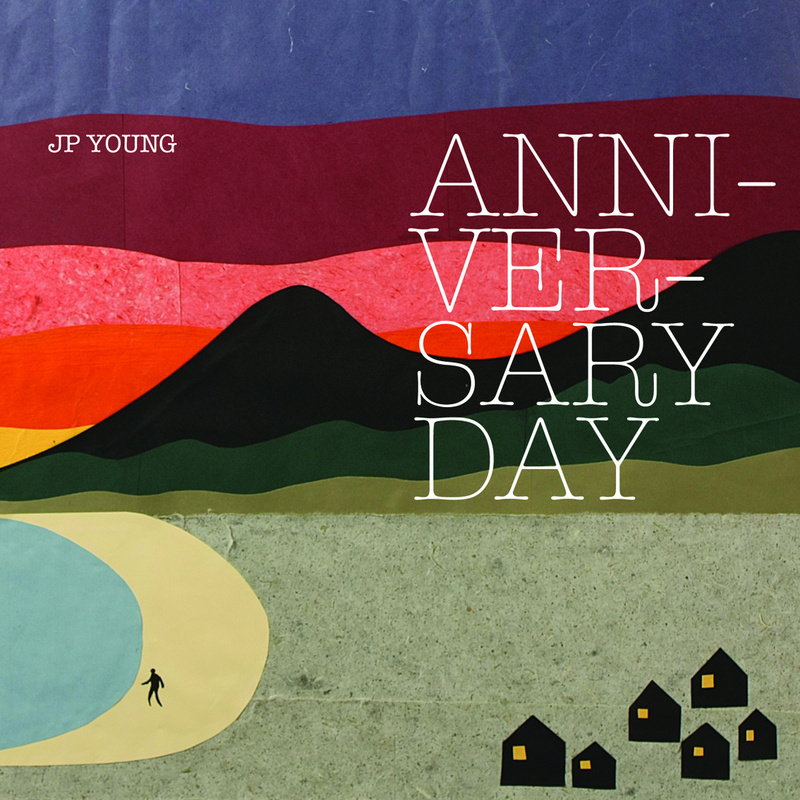 JP has just returned from a whirlwind trip around Europe and is currently at work on a third album, Anniversary Day, dedicated to John Balmer, Wellington’s first victim of a fatal shark attack, in 1852. By day, JP is a postie and a music therapist. What does Wellington look like after travelling around Europe? Have you been inspired or tired by the travelling? Wellington still looks magnificent to me. I love the landscape and the sea, and both things are immediately accessible here. It is neat to live in a city where Southern Right Whales come into the harbour and giant squid occasionally wash up on the beach. I feel very energised after a good stint of travelling. But it is nice to have periods of stability and routine to make sense of things too. Earlier this year you also toured the South Island by bicycle. What advice do you have for budding explorers on bikes? Make sure at least one of your number is passably bike-literate. Take plenty of water and insect repellent. Deal with conflict quickly. You’ve written a number of songs about shark attacks, such as one that tells the true story of John Balmer, a musician who was fatally attacked by a shark in Wellington Harbour in 1852. What is it with you and sharks? When I was much younger, it was the scary stuff about sharks that fascinated me. I would read every book about sharks that I could find. It seemed incredible to me that there were giant fish that could emerge from the depths of the ocean and eat people. As you might expect, I became quite terrified of going into the sea from reading too many books like these. But these days, it is the strange contradictions about sharks and our way of thinking about them that interest me more than the scary stuff; as much as we might fear them, they are endangered all over the world. And while they are portrayed as grisly horrors in movies like Jaws, in some parts of the world (including New Zealand) they were believed to be guardian spirits, or the reincarnations of ancestors who had passed away. Having said that, I would be pretty scared if one appeared below me when I was halfway out to the fountain at Oriental Bay. Would you rather be attacked by a shark or a crocodile? This very subject came up in the staffroom at work not so long ago. Someone made the point that there is a certain amount of ‘desecration of the corpse’ that takes place after one has been attacked (and killed) by a crocodile. Apparently, the crocodile is apt to wedge your ravaged corpse under a submerged log or a mossy riverbank, and then come back and nibble away at you for the next week or two. Great white sharks, by contrast, has been observed by researchers to actually avoid eating the rotten carcasses of seals left floating on the surface of the sea. For that reason alone, I would have to choose the shark. 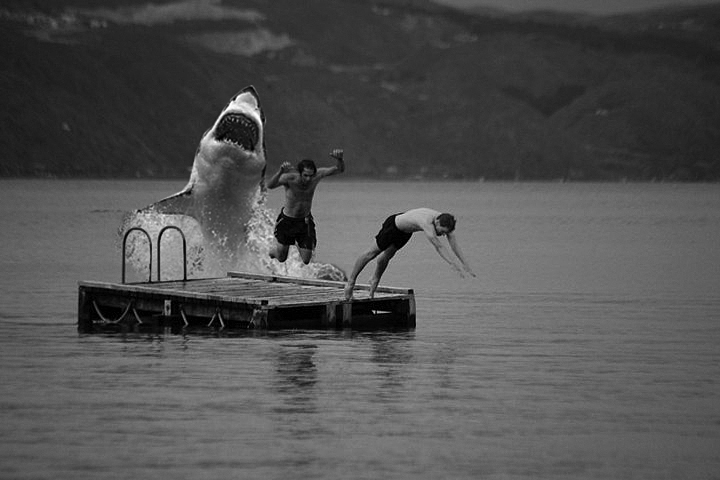 But it is often pointed out by experts that the chances of being attacked by a shark are very remote. And, what with being over-fished and butchered enmasse so their fins can be put in soup, it is looking increasingly likely that sharks will not be around to worry us for too much longer. That makes me very sad indeed. 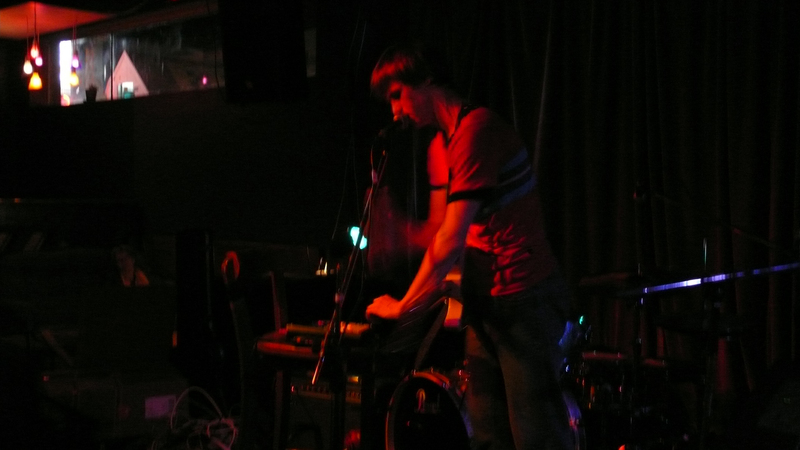 A couple of years ago, you made a startling transition from mostly acoustic- or electric-guitar based gigs to gigs using a sampler, interspersed with guitar, kazoo, harmonica, and boom-whackers. Have you encountered any resistance to this change from others? There were very few cries of ‘Judas!’ once I introduced the sampler to my set. In fact, I began getting invited to play a lot more gigs once I started using the sampler. At one gig I came in for some criticism from an audience member who felt that I was cheating and letting the sampler do all the work. It was justified criticism, as I would sometimes simply push a button and lather up the whole sound with distortion when I didn’t know how to finish a song. I tried to mitigate against that by dancing more. You’ve played a motley variety of gigs in Wellington and other places around the country, from opening for the New Pornographers to playing covers at the Island Bay Bar. From standing in front of all those audiences, what are some things you’ve observed about human behaviour? I think that music serves different purposes for different people, depending on the setting. In the examples you mentioned, the New Pornographers gig and the one at the Island Bay Bar, the people were there for quite different reasons. At the New Pornographers gig, music was the focal point of the night – people had shelled out for tickets, and were willing to stay out late on a Sunday night to see a great band. Whereas the following week at the Island Bay Bar, the audience were mainly there to have a few beers and catch up with their mates on a Saturday afternoon. So the music we made was inevitably forced to the background. It is just the way some gigs are. And even in that sort of setting, I think music can still play a role in electrifying the atmosphere; I briefly played bass in a friend’s covers band up in Queensland, and I noticed that whenever we played ‘My Sharona’, a fight would break out. My suspicion was that the energetic drum-beat and stop-start guitar riff of the song – in combination with a certain amount of alcohol – helped incite members of the audience to violence. Music therapy is a very new, unfamiliar field of social work in New Zealand. What is it like to work as a music therapist in Wellington? As you’ve noted, music therapy is still relatively new to New Zealand, so I sometimes find myself confronted with quizzical looks when I tell people about that side of my work. But most people recognise that music can have powerful effects on mood/energy levels etc., so from there it doesn’t take too much for them to accept it as having therapeutic value. Wellington is a pretty small city, so I have had the slightly disconcerting experience of bumping into former clients in social settings like the pub, or just walking down the street. Do you think Bob Dylan should give up now, or are you keen to see what he does next? I like Dylan’s music the older and craggier he gets, so I am pretty keen to see what he does next. I think he has shown himself to be a great confounder of expectations throughout his career, so you can’t be sure what he’ll be bringing to the table next. Even in his much-maligned early 80s period, he could still write stunning songs like ‘Dark Eyes’ and ‘Blind Willie McTell’. I guess the key is to approach him on an album-by-album (or even song-by-song) basis. Even so, I have yet to brave the Christmas album. Swimming and snorkelling in rivers, lakes or the sea. Going to the library (usually later in the week). Walking through town on an early Friday evening. This entry was posted in Family, Interview. Bookmark the permalink. Love JP’s Music. Nice to read this article. Great to read about Music Therapy also. Thanks Paul – yes, he’s a talented lad. He has a small but determined following. I wish it would grow! Just read a mention of you in Waikato Times magazine. Te Kuiti High School sends love…. Haha. That’s great. Thanks, Mrs. Snow. Who is it exactly that has written a song about nzs first shark victim .. Very keen to hear it! A book you might like This is a book you or someone you know might like. Bat, Bean, Beam Everyone links to Giovanni Tiso’s blog but I don’t care. It’s too good. Elliot Scribblings Londoner Elliot Elam sketches people on public transport. Five Dials Five Dials is free online magazine edited by Craig Taylor, who seems to be a genius. In Five Dials no. 32 you can read a piece I wrote about Katherine Mansfield’s birthplace. Isinglass Martin Edmond’s wonderful blog. Let Me Be Frank Sarah Laing’s compulsively readable cartoony blog on reading, writing, parenting, angsting. Oliver Burkeman My favourite writer on self-help. He really hates “The Secret”. The Animalarium This blog gladdens the heart. Celebrates animals (worldly and otherworldly) in illustration and design. The Subversive Copyeditor Carol Fisher Saller is my editing hero. The VUP blog I work as an editor at Victoria University Press, and this is our blog. Twitter Poetry Night I ran a project where you could listen to people on Twitter reading poems.